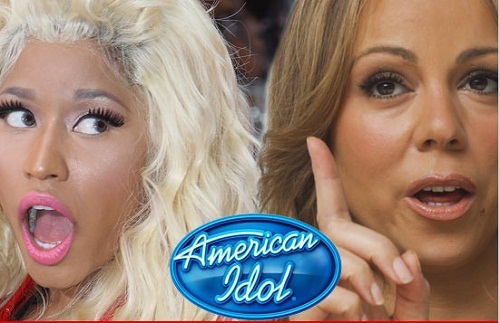 American Idol’s plans to add Nicki Minaj to their judging panel may have hit a major snag because TMZ is reporting that Mariah Carey is not happy about the decision and may walk. According to the report, Mariah was led to believe she would be the only woman on the judge’s panel. When Mariah was told that Nicki would be joining she hung up the phone. The whole thing is still up in the air because behind the scenes the powers that be can’t decide whether to have a panel consisting of two women and one man or two women and two men. Randy Jackson’s position on the new season has yet to be decided. Idol officials are still bedating if he should be brought back in his familiar spot as a judge or take on a new mentor’s role. And finally there is the issue of the panel’s race. Officials are worried that middle America may not tune if there is an all black panel of Minaj, Carey and Jackson.